The other day I was talking with my friend Julie about pedestrian tastes. Like, no matter how much you love food and no matter how great your palate is, there are some pedestrian things that you just love. Pedestrian as in low-brow, even a little trashy perhaps. I remember reading that Jeffrey Steingarten – food columnist for Vogue, judge on Iron Chef, and food snob extraordinaire – always travels with a stash of Milky Way bars because they are his favorite and he wouldn’t want to be stranded somewhere without one. Now, I am not a food columnist or a judge for a TV show but I can be kind of a food snob. But boy, do I love Chex Mix. And Kettle Korn. And while I have not stepped foot in a McDonalds in probably 15 years, I still remember their fries as being some of the best I have ever tasted. And speaking of fries – Red Robin. Love them. By the way, check back Tuesday and Thursday this week for more giveaways. And you have one more day to enter to win the Guy Fieri cookbook. 1. Combine the Rice Krispies, peanut butter, confectioners’ sugar, and butter in a medium bowl, and mix until very well combined. Firmly compress into balls 1½ inches in diameter. Place on a baking sheet, cover, and refrigerate until well chilled, at least 4 hours, or overnight. 2. Line a baking sheet with wax paper. 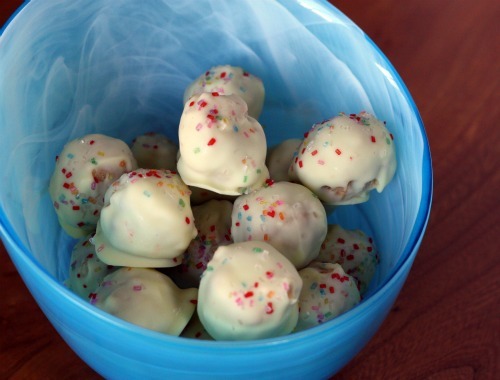 Melt the white chocolate in a double boiler over medium-low heat, stirring until completely smooth. Pour the chocolate into a wide shallow bowl. Working quickly, in small batches, roll the chilled balls in the chocolate, turning gently with a fork. Transfer to wax paper. If desired, sprinkle the tops of the cookies with colored sugar. I seriously have some major pedestrian tastes at times too…I love me some butterfingers and egg/cheese sandwiches. Can’t get too posh for the good old basics! Ha! That’s funny and a bit snobby! But I like it. I once took an elderly fancy lady to Loehmann’s (a bargain ladies clothing store on the east coast). The dressing room is one big communal room, where the ladies all take off their clothes and rummage thru clothes. It’s quite a commotion and everyone in their girdles. Her remark was “Ugh, this place is so PEDESTRIAN”!. she would not have approved of these treats…..but I do! A slightly white trash morsel. Love it. I think most of us have our guilty food pleasures that fall in this category! It’s one of the things I really like about Nigella – she loves food but she embraces the lowbrow as well as the high. These are adorable and sound delicious; I think Guy would totally approve :) I have such a weakness for chex mix and kettle corn (AND kettle chips, especially the jalapeno variety!). I love M&Ms, especially the holiday-colored ones. Don’t know why but they taste so much better when they’re festive! This is why I think the word “foodie” gets a bad rep. because people are so convinced that those of us who LOVE food can’t love things like this. When really, they are some of life’s simple pleasures. I feel similarly about Reese’s Pieces and Sour Patch Watermelons. LOVE them. I’m sure, with white chocolate and peanut butter being two of the loves of my life, that I would adore these also! These look like the perfect white trash food to me. Thank you. I love chex mix too. It’s the best thing for car trips of any sort, also airplane trips, where it is so contra-indicated, but still so wonderful. When I visit my sister and get off the airplane, she gives me a bucket of homemade chex mix. Love. I’ve been meaning to comment for a while and just say thank you, I really enjoy your writing and this space and the recipes and attitude have been so helpful to me as I’ve moved closer and closer to veg full time. I love this post! My low brow food is Rice Crispie treats. Undoctored please with extra marshmallow, not to compressed, and salted butter in the recipe. But I am open to trying anything, so I am making your Pedestrian food for volleyball camp…. So awesome. I have such a weak spot for white trash food. Maybe because I grew up with it? My aunt and mother make a pasta salad with mayo, hard boiled eggs, and dill pickles which I have dubbed “White Trash Mac-Salad.” But hey, it’s yummy! I will never not love McDonald’s sundaes with the chocolate sauce. They are perfection in a plastic cup. 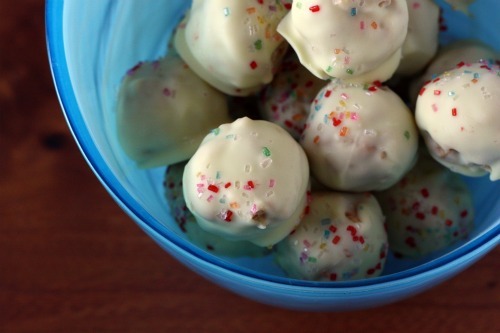 There’s something gloriously trashy about white chocolate; these look completely delicious. Also, yay, sprinkles! Dana, this is great. I can be quite a food snob, but I have some seriously trashy weaknesses. I love those bulk candy store in the mall where you can load up on all kind of gummy and chocolate candies. I have made myself sick many a time buying way too much and eating it all in one sitting. I do love trashy food and one of my favorites is slicing up a bun, buttering it and sprinkling garlic powder on it (& maybe some cheese). Pop it in the broiler and it’s a great snack. Who likes garlic powder? Me. Even when I’ve heard people diss it. Oh well. 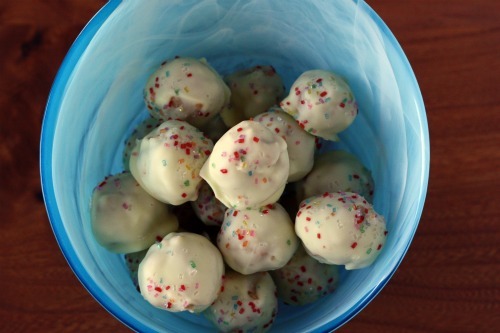 And these sprinkled balls of yum? You are a good cooker! Mallomars and chocolate oreos cannot be brought into my house because I will eat the entire package in one sitting. Pedestrian but oh so delicious! Pillsbury boxed strawberry cake with funfetti icing.